Wedding favors are small, thoughtful gifts given to the guests in appreciation for attending the wedding. They can be artfully arranged on a central table or incorporated into each place setting. Ideally, your wedding favors will be appropriate to your wedding theme, a reflection of your unique style, and a treasured keepsake for your guests. All that, without breaking the bank as well! When you're shopping for wedding favors, make sure you ask the following six questions. Can it be personalized? Personalized wedding favors make better reminders of your wedding. Metallic, crystal, glass, or wooden favors can all be engraved with the names of bride and groom, the date of the wedding, and a personal message to the guests. If your wedding favors aren't suited for engraving, include a personalized tag. A good wedding favor vendor will personalize tags for you at a nominal cost. Is it practical? The best favors have a practical use. Candles are a popular choice, but they'll only last until the wick is burned out. For a wedding favor your guests are likely to keep and use for some time to come, choose a bottle stopper, ice-cream scoop, picture frame, luggage tag, or anything else that will come in handy day-to-day. Is it unique? 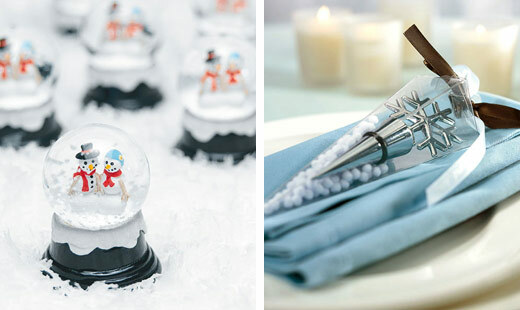 Will your wedding favors astonish and delight your guests? Unique wedding favors make your wedding more memorable. Choose not just any candle--but one that looks like a part of your bouquet. Not just any place holder--but one that looks like an ornate miniature chair, or doubles as a picture frame or luggage tag. Get the idea? Does it go with my theme? Themed wedding favors are a stylish and appropriate choice for any wedding. Specific themes such as beach, Asian, and destination weddings are easy to match with themed wedding favors. However, if you don't have a theme-style wedding, there are other ways to match your favors to the occasion. If your wedding will occur near a major holiday, use that for unique wedding favor ideas--an inscribed Christmas ornament for December weddings, sparklers for a 4th-of-July wedding, or trick-or-treat goodie bags for Halloween. Or tailor your wedding favors to the season--snowflake candles for winter, flower-themed wedding favors for spring, foliage or pumpkins for fall. Is it "us"? Will your favors make your guests smile and talk about how very "you" the favors are? The best wedding favors should relate to something personal about the bride and groom. If you love playing golf together, what better favor than a "his and hers" tee set? If you're both java fans, an inscribed coffee scoop would be ideal. If you're wine aficionados, there are a lot of options, including wine stoppers, bottle openers, and wine-themed charms. What's the price? This is important, because you'll be buying your favors in bulk. The best wedding favor vendors will offer high-quality favors at low prices. Look for extras like free personalization, money-back guarantees, and bulk discounts. Some of the best vendors offer price-matching--they'll match a lower price offered by a different store. It's tough to find a wedding favor that answers "yes" to all of the above. Don't worry about checking off every box on the list--just use these questions as ideas to narrow down your search. With luck and a little patience, you're sure to find wedding favors your guests will love as much as you do.